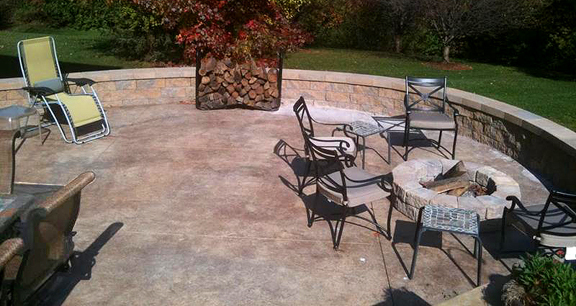 Project obstacles and solutions: The homeowner wanted to create usable outdoor space in their backyard. There was a 9' elevation drop from the back door to the lowest point in the yard. Eric Etchison from Visions in Hardscapes designed a double-cut radial retaining wall that used geogrid reinforcement for stability. The wall covered 240 square feet. The patio was then poured on top of the retaining wall. The surface of the patio and steps were produced using imix Spectra Yosemite Sand integrally colored concrete with a old granite textured skin to achieve texture. Surface colors were worked into the concrete to complement the colors of the house. The job also included a 20 inch seat wall. The other challenge on this particular job was the concern that moving concrete to the back of the house would damage an existing irrigation system. Visions in Hardscapes moved the materials from the street to the backyard via buggy to keep from damaging the yard. This project won the 2012 Short Course Award for the Residential-Patterned/Decorative Concrete category from the Indiana Ready Mix Concrete Association. Too see other decorative techniques, click here.